I've got a couple of Mailbox questions, but they're short ones, so there's not quite enough to do a mailbox. 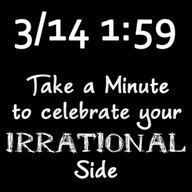 So given how long I worked on yesterday's post (and I'm still polishing a bit), I'm quite comfortable throwing up a few cheesy Pi puns and calling it a day. At the risk of enraging the "-peds" and "-pusses" mobs. Is someone butthurt that they don't get math jokes? 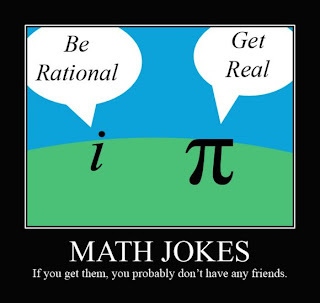 Actually I have lots of friends......who GET math jokes. 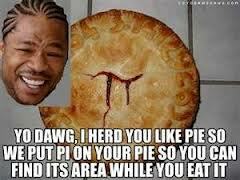 Ooooh what'll really bake your noodle is when I show you the formula for p i z z a. The Mailbox: Recant. Reflect. Refine. What is the BEST Scifi/Fantasy Series?